So you have a traditional Baklava recipe in one hand and a package of phyllo dough in the other. What next? More often than not, pre-packaged phyllo dough is available frozen rather than fresh for better preservation. It is usually sold in pre-made sheets in flat squares or rolls. Though frozen phyllo dough is more readily available in most major supermarkets, you can find fresh phyllo in some specialty stores or international supermarkets, particularly those that specialize in Middle Eastern or Greek food. Either way, working with the delicate and paper-thin sheets of phyllo dough can be tricky. Below are some tips for working with phyllo dough to make your favorite Middle Eastern desserts. If you have purchased frozen phyllo dough for your recipe, there are some crucial steps to take to make sure your dough works with you, and not against you, during the preparation of your dish. Don’t let it defrost too quickly. The trick to thawing phyllo dough is to make sure that it doesn't defrost too quickly. When the dough is too damp (generally from too much condensation in the defrosting process), it becomes gummy and the thin sheets will stick together, which in the world of phyllo is synonymous with unusable. Defrost at room temperature. Upon removing the phyllo from your freezer, keep it in its original packaging and place it directly into the refrigerator. Never thaw at room temperature, as it will thaw too quickly and collect too much moisture. Do not separate until completely thawed. If you try to separate the sheets when they are too cold, they will crack. Your best bet is to keep them in their packaging in the refrigerator for 24 hours. This is enough time and just the right temperature to ensure usable sheets of phyllo. 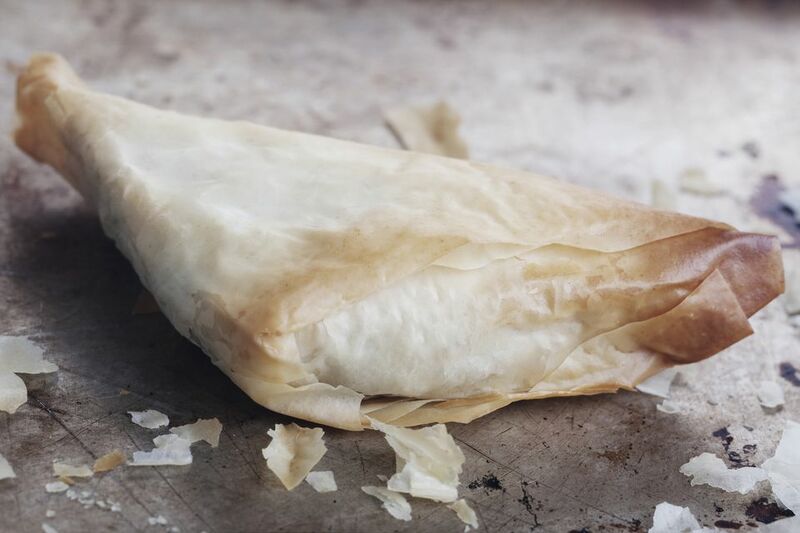 If you do find your phyllo sheets are still cracking or tearing, you can trim the sheet to remove the tear. If you are in mid-recipe and come across a tear, simply put another sheet over your damaged one. Once baked, it really won't be noticeable. Once defrosted and ready to go, you have to move fast, as phyllo dough dries out very quickly. If you have purchased fresh phyllo, on the other hand, you are ready to go. Fresh phyllo can be kept in the refrigerator for up to two weeks if kept tightly wrapped or in its original packaging. Phyllo dough can also be frozen (or re-frozen in the case of thawed phyllo) for 2 to 4 months.